Computational thinking is a critical thinking skill that, according to some, is a required skill for success in the 21st century. This article from Jeanette Wing of Carnegie Mellon University describes what computational thinking encompasses. For most students, exposure to computational thinking as a problem solving tool comes late, or not at all. Since Fall 2010, the ISU Computer Science Department has been making efforts to change this in Iowa K-12 schools with a series of events and workshops designed to help K-12 educators, parents and students learn about computational thinking. Click the links below to learn more about our programs. The Iowa curriculum includes modeling as a requirement for student learning. In this workshop, Dr. Les Miller from the ISU Computer Science Department and Rob Kleinow, IT/Science Consultant for the Heartland AEA, will help you learn how to use Scratch to model concepts in the classroom. Scratch is a programming language learning environment that allows beginners to create interactive content such as stories, games and art. This workshop will help you develop classroom curriculum modules in Scratch to help your students model, with computational thinking, any subject in the K-12 curricula. In this 1 hour interactive presentation, parents, teachers, and students work side by side to learn about computational thinking and how to use Scratch to model concepts learned in the K-12 classroom. CS faculty will come to your school or local public library, or groups can come to the ISU campus and attend a workshop in a campus computer lab. Contact us at allscience@iastate.edu to set up a family/student night. Held in the Pearson Hall Computer Labs on campus, the CTC Workshops offer students a chance to get started with computational thinking projects. Parents and teachers can also participate! 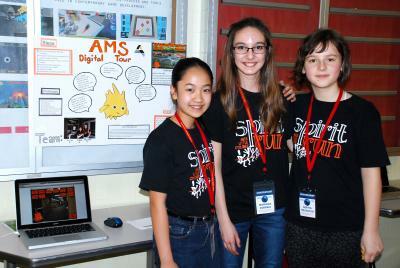 Students who have developed a computational thinking project can demo it at our annual Computational Thinking Competition. This is a downloadable zip file of handouts and tip sheets that we use for CTC workshops and family/student nights. Includes sample scratch programs!